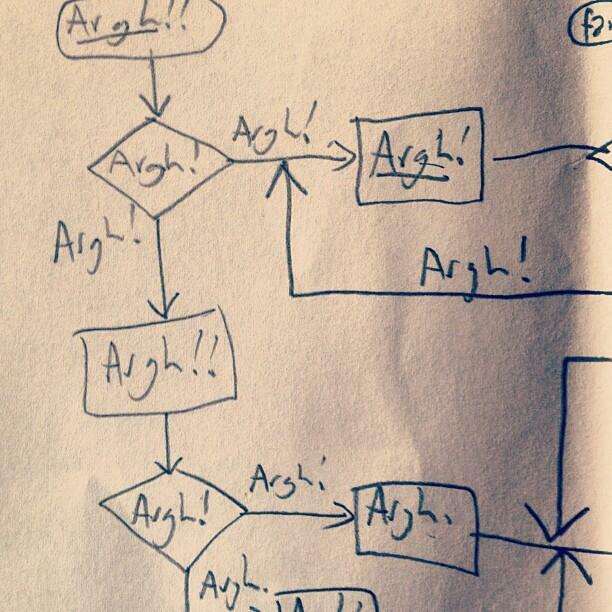 A flowchart of what programmers do at work all day. I've probably drawn this picture 100 times. In meetings or on the bus, while trying to get started on human or technical problem I don't understand, at times when I'M STUCK. I was cleaning up today, and took a photo of one copy of it, before I threw it out. I put it on instagram, so I could feel 'done' about it. Then Jeff Atwood tweeted it and next thing WOW. I can barely get onto my phone for it exploding with news about comments and retweets, from programmers all over the world, who seem to feel exactly the same way a lot of the time.